Charging USB devices while traveling in Europe is frequently problematic. Travelers typically plug their USB charger into a foreign adapter, then plug the adapter into a wall or floor outlet. The problem? Wiggly connections. I have used scotch tape to attach a charger and adapter to each other, but it was a kludgy solution that took up a lot of space space in my small electronics bag. Making a quick trip into an electronics store on a recent trip, I purchased the device pictured just above. 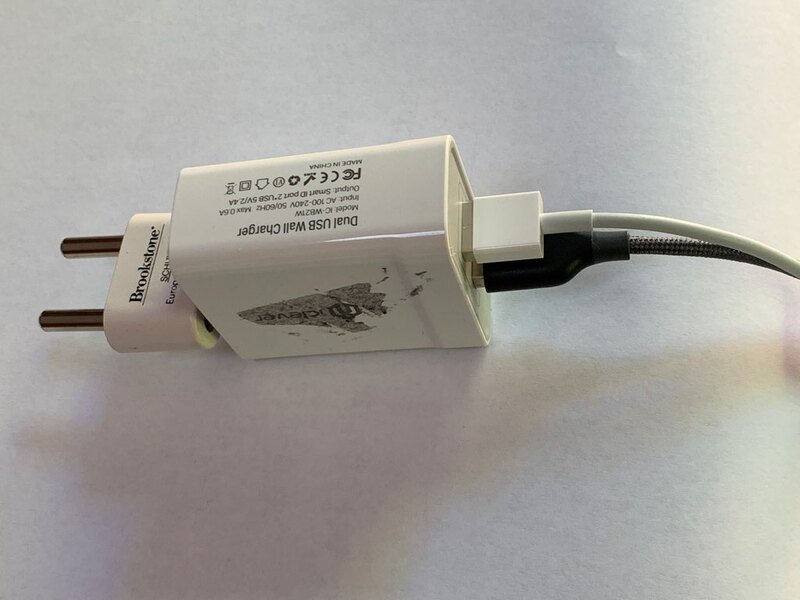 I replaced my charger + adapter with one small (3" long, 1.5" wide, and .63" thick) foolproof device that fits European plugs. Not available in the US, I recommend looking for something similar the next time you're in Europe. It was less than 10€ ... and so worth it! 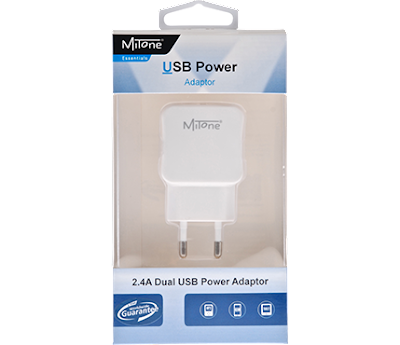 If your travels are taking you to England, you can find a similar charger there, albeit with the kludgy power plugs common to the UK. Well worth it, especially for business travelers. copyright (c) 2019 by Ourisman Travel LLC. All rights reserved. We provide Virtuoso and other Preferred Partner amenities as an affiliate of Brownell, a Virtuoso® Member. If you have comments on this column, or questions about booking travel, email me or visit my website. The sight of Notre Dame in flames was so overwhelmingly sad. I've always been a francophile. Paris has always been my favorite city in the world. 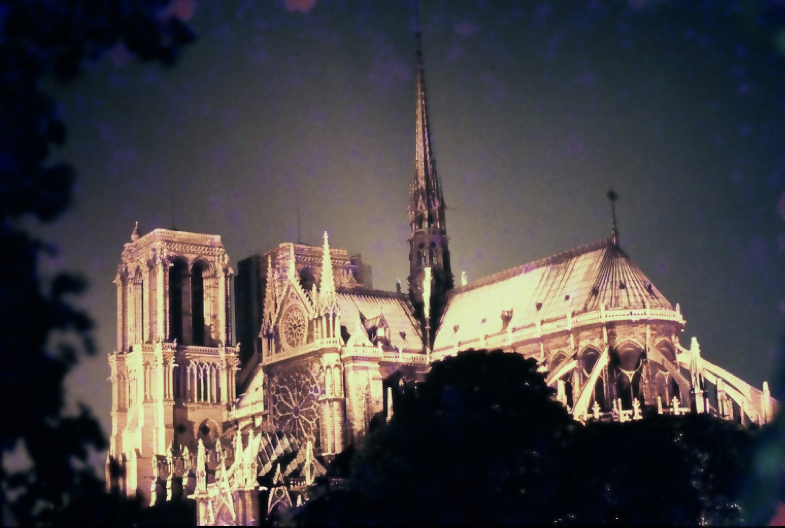 Notre Dame represents the heart and soul of Paris, indeed of France. The photographs of the fire were so tragic, this iconic Gothic cathedral at the center of Paris on fire. I first visited Notre Dame in 1969, my first trip to Europe (fifty years ago!). After visiting London and Amsterdam, the student group I was part of continued on to Paris. I captured the image below with my Minolta SRT-101 film camera; I believe I was using Agfachrome ASA 64 slide film. I have visited Paris many times since, more than I can count. 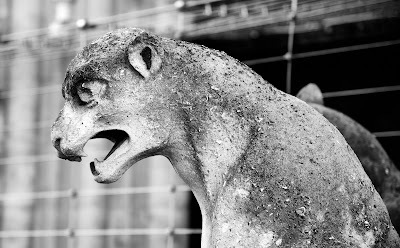 My most recent visit was this January when I climbed the tower and captured the close-up image of a gargoyle (see above). How to visit any cathedral... (at least how I do it). I always walk to the very back of the sanctuary and stand in the center aisle, behind all of the seats. I stand there for awhile — or even sit in one of the pews — and look forward and upward, taking in the soaring lines of the arches as they lead my eyes to the heavens. This is the very purpose of Gothic architecture. When you visit any church, try to sense what the architect wanted to convey to worshippers. If you can, attend a service or a concert. Enjoy the cathedral the way it was intended — as a place of worship, not as a tourist attraction. It's impossible to imagine Paris without Notre Dame. I intend to contribute to the reconstruction fund, and I hope one day to visit the fully restored cathedral. 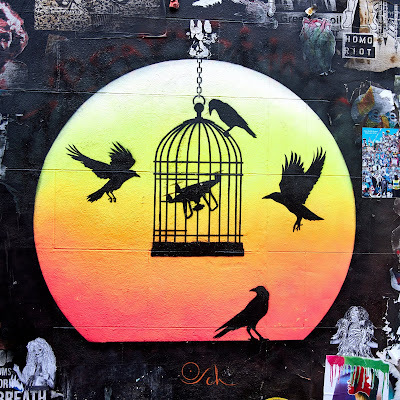 I have often recommended the free walks offered by San Francisco City Guides. Both interesting and informative, taking one of these walks is a great way to learn about the history, culture, and contemporary life of San Francisco. The walks are sponsored by the SF Public Library and supported in part by hotel taxes and contributions from walkers. If you're planning to be in town, definitely check out the schedule and take advantage of this great resource available to visitors and residents alike. Our walk this morning was the best that I've ever taken. The Omni Hotel Walk is named somewhat deceptively. Being one of the major sponsors of City Guides, the hotel has arranged for this walk offered primarily (but not exclusively) to their guests every Saturday morning at 10 a.m. While the regular Chinatown Walk attracts a large crowd, our Omni walk had but four participants — two hotel guests from Chicago, Claire, and myself. Along with Hope, we walked the back alleys of Chinatown, away from the touristy storefronts on Grant Avenue. 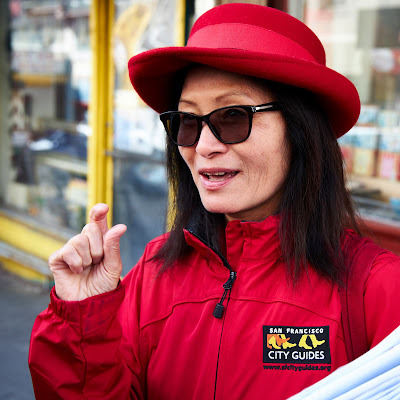 Hope is a gifted tour guide and shared stories of the waves of Chinese immigration to San Francisco, beginning with the Gold Rush. We saw Chinese markets selling spices, seafood, and vegetables. We visited a Temple, saw a fortune cookie factory, and visited an alley that used to be an opium den. As a special treat, we ended up on an alley with a Chinese festival going on. Hope left us with a list of recommended Chinatown restaurants — not the tourist traps on Grant Avenue but truly authentic restaurants mostly filled with Chinese Americans. We had lunch at one of her choices — Boiling Shrimp Seafood at 150 Waverly Place. The restaurant was packed. We sat at a large round table with a family of Chinese Americans from San Francisco, shared our food with one another, and communicated as best we could with Google translate. It was a great lunch and a great cultural experience ... all just 30 minutes from home! Email me for Hope's list of restaurants. I've seen all the major sites, including some further afield sights (Oxford, Bletchley Park, Windsor Castle), although I do plan to drop into the Victoria & Albert because I love it so. Exploring markets is another priority. But aside from that, what hidden gem parks or museums or neighborhoods have you encountered that warrant my time? Take a walking tour of East London. While you can certainly walk through this neighborhood all by yourself, it's infinitely more interesting and informative to go along with a well-informed guide. You can join a scheduled public tour (google walking tours London), or for a tour at your own pace that's focused on your and your interests, we can find you an expert Blue Badge guide. East London is a mix of old and new. You'll enjoy shopping in the Old Spitalfields Market, walking past historic buildings, learning about the history of the neighborhood, and viewing some quite interesting street art. Explore London's secret Underground. The Charing Cross tube station contains the entrance to a virtually unknown secret hideaway. Located behind locked gates, you can get a tour of an empty, unused subway station and tube. You've probably seen it on movies with London underground scenes, and one of the coolest parts of the exhibit is a video presentation of some of the movies that have been shot in this secret location. Experience the Changing of the Guard inside the Wellington Barracks. Thousands of tourists per day crowd in front of Buckingham Palace to witness the daily 11 a.m. changing of the guards, perhaps London's most popular tourist attraction. But savvy tourists can watch the spectacle from inside the Wellington Barracks (where the guard lives). You'll be up close and personal with the guard, enjoy their daily band concert with literally no one between you and the soldiers, and watch as they march down the short spur to Buckingham Palace. View the Ceremony of the Keys. An uniquely British Experience, this ceremony take place nightly when the Tower of London closes for the evening. While the limited public tickets are usually reserved far in advance, our contacts might be able to get you space to view this little-known example of royal pageantry. Sit in Churchill's chair. The general public can queue up to buy tickets to see the Churchill War Rooms, and they'll be part of a long line of tourists peering through the plexiglass window into the room where Churchill's war cabinet met. Sometimes, they'll see a small group of tourists inside the room, actually sitting in Churchill's chair, and wonder, "Just who are those VIP's?" We can get make you one of those VIP's! Want a ticket to a sold-out V&A special exhibition? If you've booked a stay at nearby Egerton House Hotel through a Virtuoso travel advisor, you get an exclusive pair of member tickets to all current exhibitions with full access to the members lounge. You'll also received a fully daily English breakfast daily for two, Afternoon Tea for two, a martini making lesson, an upgrade if available, and a one-way airport transfer for Suite bookings of three or more nights. (You can even book online using this link). First of all, this is a gorgeous itinerary. 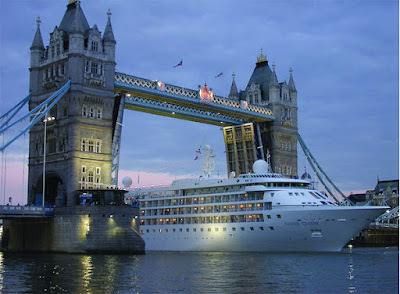 You spend your first evening in London, then set sail the next day on the Thames going under the Tower Bridge. Heading out to sea, your ship (the Silver Wind) cruises through the North Sea toward the gorgeous western coast of Norway. Norway's fjords are the most beautiful place I've ever been. Second, you're on Silversea enjoying the intimacy of a small ship with just 296 guests with so much included in your fare — including round-trip airfare, transfers, an upgrade at booking, butler service, unlimited Free WiFi, beverages including champagne and select wines and spirits, complimentary transportation into town in most ports, and included gratuities. Third, you receive a $250 Visa gift card in addition to any other promotions, including Virtuoso Voyages amenities for selected cruises. This exclusive offer is available from any Brownell Travel advisor, including the team at Ourisman Travel. 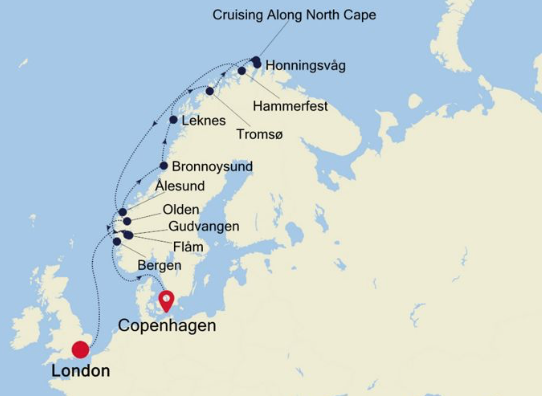 Finally, this offer is value on ANY Silversea cruise (including this particular cruise that captured my imagination). Just make your booking during April, 2019. Here are five good reasons to book this cruise, departing 27APR, 2019 from Athens to Barcelona. (1) There's a two-week sale on this cruise aboard the Seabourn Ovation. Book by April 8th for Veranda suite upgrades and shipboard credits. Cost is from $2,999 per person. (2) Virtually everything is included — Seabourn luxury on an intimate ship with all ocean-front suites, complimentary premium spirits and fine wines, no tipping, and Thomas Keller-inspired dining. 27APR — stay in Athens the night before, and explore the Acropolis on the day of your departure. 28APR — Pylos, Greece, on the southwestern coast of the Peloponnese, affords sightseeing opportunities to the castle of Neokastro or the achaeological site of Messini. 29APR — a day at sea, a chance to relax and let Seabourn pamper you. 30APR — dock in Naples and visit Pompeii and Herculaneum or perhaps the Amalfi Coast. 1MAY — 14 hours on the ground in Rome; ask you you can book a guided tour by Vespa. 2MAY — you'll spend the day at Bastia on the French island of Corsica, Napoleon's birthplace. 3MAY — walk narrow streets and small squares of Toulon, a harbor townon the coast of Provence, France. 4MAY — Palamos, Spain: Visit Dali's Castle Museum or wander through the town of Girona. 5MAY — Barcelona. Experience the innovative architecture of Antonio Gaudi. (4) Receive Virtuoso Voyages amenities, your choice of a complimentary shore excursion in Palamós, Spain, a $175 per person credit towards a Virtuoso product (pre-cruise stay, post-cruise, stay, or shore excursion through a Virtuoso onsite), or a $150 per person shipboard credit. (5) Meet me onboard! I'll be joining the cruise in Rome, along with my friends and colleagues from Brownell. 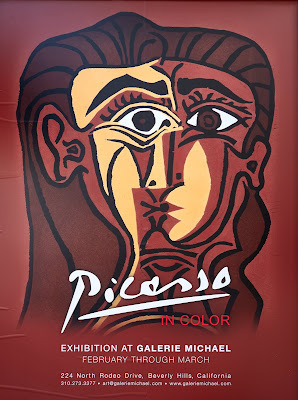 But if you want to shop somewhere totally unique, drop into Galerie Michael, a small, privately owned art gallery at 224 North Rodeo Drive. 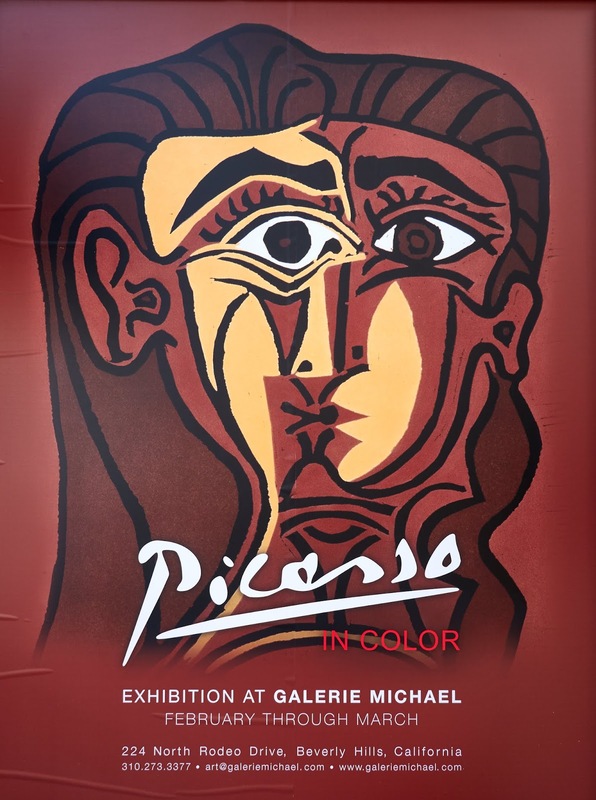 The owner possesses an extensive collection of 20th century art, just a small fraction of which is on display You’ll be able to view original works by Picasso, Chagall, Dali, and Miro — as well as some pre-Impressionistic paintings and even some older works by Rembrandt. If shopping ‘till you drop appeals, you’ll find price tags as high as $1 million. I wasn’t tempted, although several works by Chagall, priced below $3000, seemed reasonable. Part of the short cobblestoned pedestrian walk at 2 Rodeo Drive, I encourage you to visit. John Welch, the gallery’s curator took pleasure in showing us around. Galerie Michael was easily the highlight of our walk around Beverly Hills. We work with destinations all over the world; our specialties, just to name a few, include safaris, luxury cruises, Hawaii, Bali, and luxury hotels throughout the USA, Europe, and Asia. Get in touch if you're planning a trip! (c) 2006 - 2017 by Ourisman Travel. All rights reserved. California Seller of Travel 2110210-80. Powered by Blogger.